Yes, you can't trade for extra allocation in advance of an international season. I presume you can't sign players without having money available (or do you have to get the money by June 30?) in which case the Phillies have targeted one or more players. Possible this is a byproduct of the new Mexican League agreement as several prospects became available in the last few weeks and there may not be many teams that could go higher than $500K. 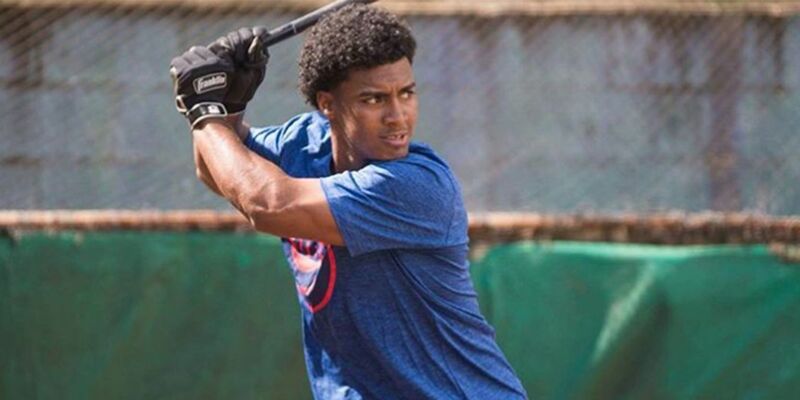 The signing that caused all the chaos was the Cubs signing Florencio Serrano for $1.2 million with 75% of that going to his club and only $300K to the player as the Cubs were in the penalty, Now the kickback is only 35%. We could offer the kind $500K with another $175K going to his club potentially. The Brewers also were linked to a catcher (Villalobos) that was ranked 34th on the BA Top 50. Serrano might be as old as 19 by now (he was a 2017 signing originally and he had to wait a year because he played a little HS baseball as a freshman in Texas). It sounds like the Cubs weren't the bad guys ... they kinda got screwed. Fun fact- next signing period teams will be limited to only be able to trade for up to 60% of their starting allocation pool. any indication how much they got? I think we had about $900K left before we traded the slot to Miami for Realmuto. Assuming they got that slot back (and none of the deals were for double slots), then they probably have something in the $500K-$700K range unless Tejada Jr. got more than say $200K. Hard to know exactly of course. Yolbert Sanchez (Cuban SS - Good defense/questionable offense) is still out there too. Plus the Taiwanese infielder we were in on: Lin An-Ko. PhuturePhillies has us signing a P named Victor Lopez on 3/30. Can't find anything on him, so he is likely not the extra signing that they might do with the extra international slot they acquired. I figure we have to wait until mlb.com lists the signing in the transaction, because they'll have a player page on him then - date of birth, nationality, height/weight, RH vs. LH. As of now, it's a name. I added Lopez to my list this morning, with the signing date as tentative (the official dates often are later than what Jim reports from Clearwater - I suspect there's some Commissioner's Office approval involved), but all the other columns are blank. Fangraphs with the first part of a series about the value of international dollars in talent acquisition. A return of 650% was the conclusion for the current bonus-limited system. Part 2 will look at classes from individual teams. This definitely makes the case for spending as much as possible internationally, even if the ROI stabilizes a bit. Cost of trading for allocations will also increase without teams in the penalty, though these numbers indicate it is still something worth doing. It is yet another way for cash-rich teams like the Phillies to take advantage of smaller market teams. After analyzing bonus pool data, what ROI do teams get from international spending? Lopez signing has now shown up on mlb.com transactions page. RHP, Dominican, born 9/2/99, so 19 years old. Philadelphia Phillies signed free agent RHP Saul Alcala to a minor league contract. Alcala's a RHP Venezuelan, born 11/7/00, so 18 years old now. So great, Trump wants to Nix new rule that Cuban players don’t have to defect or declare their intentions to have residency in the U.S.
Everything that Trump touches... dies. He has the Sadim touch. 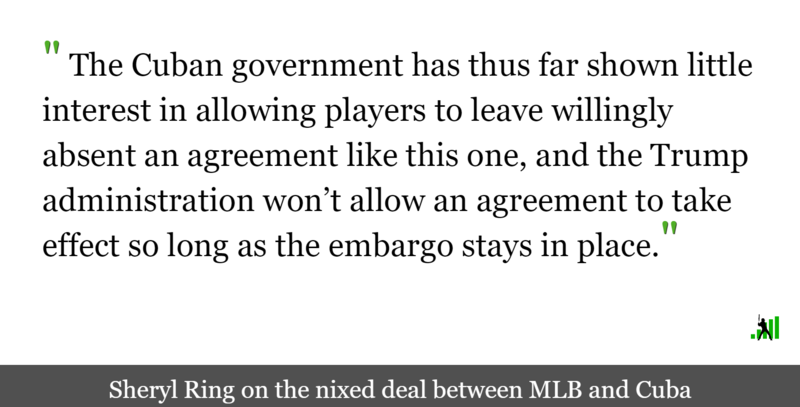 The Trump administration nixed the posting agreement between MLB and Cuba. It most probably means exactly that. MLB organizations are dominated by so-called "conservatives" (actually, corporatists), who mess around in Congress over worker's rights, etc., and at least tacitly support the clown in the White House. I can't cry too many tears to see the orange monster sticking it to them. What I said above: everything he touches, dies.